Sonic fan games have always had a special place in my heart. It’s where I started in the Sonic scene! From Sonic Boom to Sonic Fan Remix, they all have one thing in common: a vision to create a Sonic game that can be enjoyed and shared by everyone the world over. Recently, I had been checking for new fan game releases, and I came upon a fan game by Oddwarg that seems to stick out above the rest. 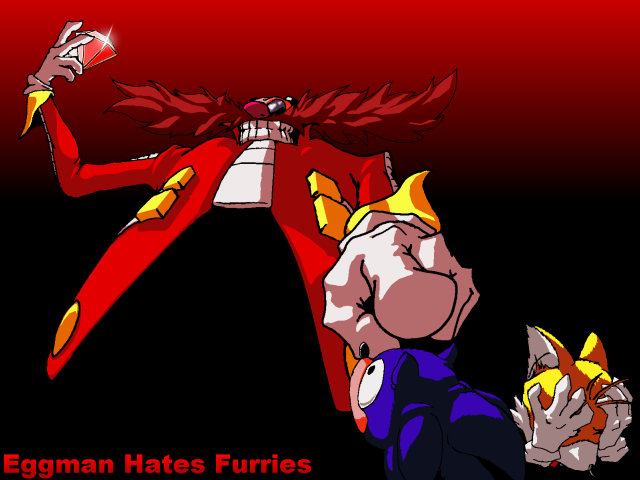 Eggman Hates Furries. Fast and frantic, this Sonic fan game has you on the edge of your seat until the very end (an ending which you won’t see coming, I can tell you that), and is executed flawlessly as levels flow into each other, and the boss fights make you freak out, wondering what they might do next. The trailer for the game doesn’t do it justice, so I highly recommend downloading it. Right now. Also, check out the other games Oddwarg has on his site. Super Sawman is a classic. LightningWolf3 on YouTube made this awesome remix of a Touhou song using Sonic 2 sound effects. It’s incredibly catchy and a very innovative piece of work. Check it out!